We investigated risk factors for colorectal cancer in early-onset cancers, to provide quantitative estimates for major selected risk factors. We analyzed data from three Italian and Swiss case–control studies conducted between 1985 and 2009, including 329 colorectal cancer cases and 1,361 controls aged ≤45 years. We computed odds ratios (ORs) from unconditional logistic regression models, adjusted for major confounding factors. The OR of young-onset colorectal cancer was 4.50 for family history of colorectal cancer in first-degree relatives, the association being higher in subjects with affected siblings (OR 11.68) than parents (OR 3.75). The ORs of young-onset colorectal cancer were 1.56 for ≥14 drinks/week of alcohol, 1.56 for the highest tertile of processed meat, 0.40 for vegetables, 0.75 for fruit, and 0.78 for fish intake. Among micronutrients, the ORs were 0.52 for β-carotene, 0.68 for vitamin C, 0.38 for vitamin E, and 0.59 for folate. No significant associations emerged for physical activity, overweight, and diabetes. This study—the largest on young-onset colorectal cancer—confirms that several recognized risk factors for colorectal cancer are also relevant determinants of young-onset colorectal cancer. 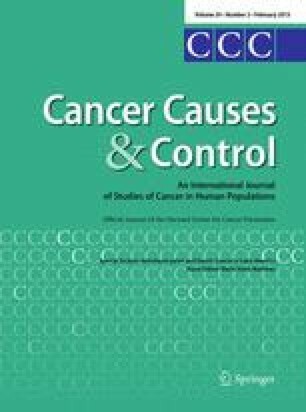 Family history of colorectal cancer in particular is a stronger risk factor in young subjects, as compared to middle age and elderly ones. This work was supported by the Italian Association for Cancer Research (AIRC), Milan, Italy (Grant No. 10068), and by the Swiss League and Research against Cancer/Oncosuisse (Grant No. KFS-700, OCS-1633). The authors thank Mrs. I Garimoldi for editorial assistance.